With 90% of all data in the world created in just the past 2 years, you’ll probably be surprised to hear that thinking processes generated 2,500 years ago can still help us to make sense of this explosion of information. Critical thinking through rational, unbiased analysis is still a bedrock for survival in business today. While disruption and innovation are very important (see our Future of Thinking Series parts I and II for more on these topics), modern critical thinking models are the linchpin that determines success or failure in nearly every industry and job. If you want to learn how to focus on essential information, ignore irrelevant inputs and solve complex problems, one key will be to understand critical thinking and when to apply it. Join Jason O'Neill, Head of Global Training Services with Kepner-Tregoe and Veena Rajkumar, Learning & Development Program Manager, Western Digital, in the third and final installment of our "Future of Thinking" series where they’ll discuss how critical thinking is more important today than ever before. Because it is important that our clients have access to the finest problem-solving tools on the market, we’ve developed 2 NEW digital solutions that make KT problem-solving more accessible and easy to use. Please join us to learn about these new KT applications. • KT Solve is a browser-based tool that allows users to leverage KT process, store records in the cloud then, access them from any device anywhere in the world. A free version is included for KT workshop participants with premium versions available offering advanced features. • KT eLearning is a self-paced modern learning platform accessible from any device that offers learners access to fresh KT tutorials to deepen and refresh their knowledge of KT’s processes. • How KT Solve accelerates an individual’s learning experience and reinforces the use of KT process back on the job. • Through examples of KT’s new eLearning content, learn how this platform can be utilized to deepen the skills of new KT workshop participants past as well as to refresh problem-solving skills of past KT grads. • We’ll show a sneak peek of new KT products to be released in 2019. Over the past decade, the decision making process has become increasingly complex. Decisions that used to be made by a handful of leaders huddled in a conference room now require multiple stakeholders across globally distributed teams with exponentially more data inputs. The ability to confidently make recommendations and defend those choices in this business landscape is important - especially when the outcome is unpopular. In this webinar, we’ll be looking at five factors that drive the quality of problem solving. Suitable for for anyone in industry and IT who has to deal with supplier quality issues. Almost all of us know the tragic story of how the Titanic hit an iceberg on its maiden voyage, sinking in the North Atlantic Ocean, killing more than 1500 people in the process. When uncovering the cause(s) of this catastrophe what is revealed is a chain of over 30 events that lead to the Titanic’s fatal crossing. IT incidents such as major system outages or database security breaches often are triggered by a series of events, each seemingly harmless but, given a certain progression creating a perfect storm. Without systems in place to see the signs of an impending emergency, our ability to avoid a major failure is gone. Worse yet our organization remains at risk, history will repeat itself as the root cause has never been addressed. Join Shane Chagpar and David Frank as they take you through a Proactive Problem Management journey using the example of the systematic group of failures that lead the Titanic to that iceberg to help you understand how service organizations can manage risk effectively and avoid business failure. A workforce of skilled root-cause analysis (RCA) practitioners is every manager’s dream. A possibility which is often stifled by the reality of the many hours of training required for a positive impact. Imagine if we could cut traditional training time by greater than 75% to the first responders. These are the operators who are crucial to your team; are best placed to troubleshoot and collect evidence before it is destroyed. They are also the ones who are most difficult to take off-line for weeks at a time. “Micro MBAs” and “Nano Universities” geared for office professionals are designed to reduce the time traditionally needed to fulfill learning requirements. Taking a page from these “Micro-Learning” techniques, Kepner-Tregoe has designed a training solution that keeps crucial operators on-the-job while they learn. An approach that offers a path for your operators to work towards RCA mastery at a much faster pace. Join us as we discuss how to implement operator microlearning and the latest cloud-based solutions for daily management practices that allow you and your workforce to address root cause in real-time. Discover the components of a multi-disciplined daily management system that includes items such as escalating morning meetings, operator standard work, leader role modeling via daily walks, simple reporting templates and even phone-based apps providing prompts, guidance, and governance in the palm of your hand. The future of work will look different than the current landscape, and it is approaching rapidly. To prepare, companies must “future-proof” their organizations through a re-evaluation of behaviors to embrace change. One of these behaviors is how we think which has the capacity to handle the significant challenges (and opportunities!) that will come from IoT (Internet of Things), AI (Artificial Intelligence), Machine Learning and many other Industry 4.0 trends. Simple tweaks to existing “thinking” will not be a match for what’s coming. We need a fresh and powerful perspective - a disruption - in the way we’ve approached thinking in the past. Sign up for our free webinar to understand Disruptive Thinking to future-proof your organization. Join Veena Rajkumar, Learning & Development Program Manager with Tegile, A Western Digital brand, in the first part of a webinar series about The Future of Thinking. Veena will discuss Disruptive Thinking – a method to alter the status quo, identify unique ways to solve real-world problems using simple ideas and existing resources and build effective results. Businesses will soon experience productivity decline from a workforce unprepared and unable to provide the competitive advantage needed to survive in the modern environment. What we can predict is that change will be a constant and will include many technological advancements. In this webinar, Jason O’Neill will discuss how Learning & Development (L&D), Human Resources (HR) and Training functions will have a pivotal role in leading this effort – by guiding employees to the tools, techniques, and resources to help them navigate change – and by taking an active role in preparing their organization for the future of work. Before a pilot is given the keys to fly a passenger jet they spend many hours in a simulator preparing to avoid dire consequences. Troubleshooters in all walks of life prepare for real-life calamities by studying theory and working through case studies none of which replicate the pressure cooker they find themselves in when things have gone pear shaped. Kepner-Tregoe will be demonstrating a method that has answered our clients needs to hone troubleshooting skills in a safe to fail environment. One that simulates the pressure cooker of a real-live challenge complete with consequences and rewards for actions taken. This video is the fourth and final part of a presentation from Dave Broenen of Cisco Systems telling how Cisco turned the tables to get profitable results from their support organization. In this instalment Dave talks about how to maximize the adoption of your problem solving strategies and overcome the change resistance that inevitably comes with initiatives of this type. In this third installment of a presentation from Dave Broenen of Cisco Systems telling how Cisco turned the tables to get profitable results from their support organization, we find out how to get your problem solving processes working on a much larger scale. Dave also discusses techniques for overcoming resistance to these new techniques. "In order to drive performance, service organizations must leverage their most valuable service asset - people. This is part one of a presentation from Dave Broenen of Cisco Systems telling how Cisco turned the tables to get profitable results from their support organization. Dave discusses why a strategic, process and people driven approach is critical to delivering a consistent, high quality problem resolution throughout the service organization. He shows how to design a program that fosters results that are profitable and sustainable throughout the organization." People are the most valuable service asset that an organization has. In this video, which is part two of a presentation from Dave Broenen of Cisco Systems telling how Cisco turned the tables to get profitable results from their support organization, we learn about the issues associated with case difficulty and how having robust problem solving processes can help get to the bottom of even the most difficult case. Shellina Damji, a practice leader at Kepner-Tregoe discusses the service excellence program at K-T. What differentiates K-T is its solid methodology in trouble shooting. K-T is focussed on building capability in the technology space. Building partnerships with companies like ServiceNow allows them to embed the K-T methodology right into the toolset. K-T is recognised as 'best in class' for troubleshooting. Customers have confidence that they are receiving the best training possible when they engage with Kepner Tregoe. 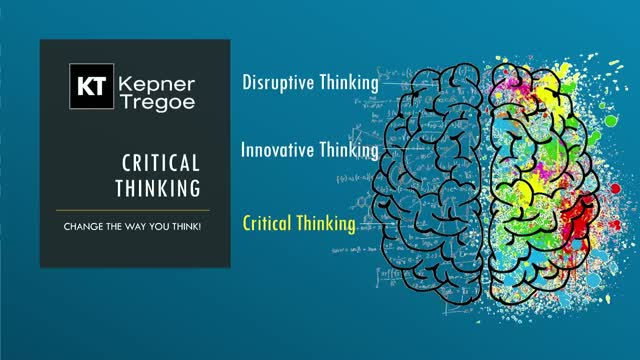 Kepner-Tregoe's Shellina Damji discusses the value of the K-T critical thinking methodology. K-T is particularly known for its problem solving methodology, particularly in incident management, problem management and change management. K-T allows businesses to close the gaps they have in the processes, bringing incidents and problems to resolutions quickly. K-T training allows organizations to raise the skill level of their staff, giving them new competencies in trouble shooting and problem solving. Successful companies are highly dependent on their partners in their supply chain. They must remain vigilant to assess their output quality, manage, mitigate and identify the root cause of any problem that arises. In this webinar, we will focus on quality management in the supply chain and some of the key levers that can be pulled to ensure you are not the next company on the nightly news. Kepner-Tregoe’s Advanced Incident & Problem Management plugins for ServiceNow give your team the tools they need to improve MTTR, incease your first call resolution rate and ultimately improve your customer satisfaction levels. Improved problem solving will also reduce your service and support delivery costs. K-T techniques will allow your incident and problem management teams to gather more information, quickly and with less documentation. Using an easy to follow roadmap they will have a common approach to problem solving, prompting them to ask the right questions at critical times. You will get to the true root cause faster, minimizing unnecessary and costly outages. Software and templates don’t solve problems. People solve problems. What kind of people? People who are curious, ask great questions, make decisions based on facts, and are empowered to lead. They remain focused under pressure and act confidently to do what needs to be done. Where can you find these problem solving leaders? They work for our clients and here at Kepner-Tregoe. For nearly 60 years, Kepner-Tregoe has empowered thousands of companies to solve millions of problems. If we can save millions for a manufacturer, restore IT service for a stock exchange, and help Apollo 13 get back from space, we can help your business achieve success. We empower you to solve problems. Kepner-Tregoe provides a unique combination of training and consulting services designed specifically to get to the root cause of problems and permanently address your organizational challenges. Our systematic, data driven approach to problem solving will deliver measurable results to any company looking to improve quality and effectiveness while reducing overall costs.